FROM THE US OPEN – Maria Sharapova went on the court and she knew that she had to focus all the time, or she would lose. She didn’t, and she was very smart, beating Jelena Ostapenko 6-3, 6-2. It appeared this could be a close contest. In fact, it should have been, because in Madrid in May, Sharapova outlasted her 6-7(6), 6-4, 7-5. Both of them are huge hitters, from the forehand and the backhand, down the line, deep, and right on the lines. They are incredibly powerful, but this year, both of them have produced a lot of errors. 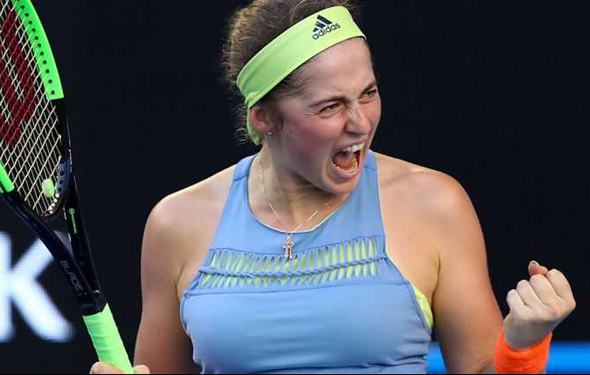 On Saturday, Ostapenko had a ton of errors, and that is why she lost. She lost her concentration, and she sunk. Believe it or not, Sharapova has won the night sessions at the US Open, 22-0, and counting. She has only won the title just once, in 2006, defeating Justin Henin. Since then, she has had a few chances, but she didn’t convert. Can the 31-year-old do it again? Perhaps, but this year, I would be pretty surprised if she grabbed it. She has been hurt a lot this year and, while there are days when she looks very good, but there are also events when her serves are surprisingly weak, with many double faults. But she was fairly clean on Saturday night. She can nail her forehand and backhand, but she still can be erratic, and a little bit slow. Sharapova always practices; she loves the sport; she wants to add to her game. Maybe she will, but her right shoulder is sore. It has been for years, and she cannot use a lot of spin when she is serving. But once the rallies begin, she can rake it. Ostapenko swings away, blasting her strokes, crosscourt, extremely hard, and down the line. The Latvian has won one at a Slam, at the 2017 Roland Garros, but now the 21-year-old makes so too errors and she insults herself. Eventually, though she can calm down and she can return to the top 5 very soon. Sharapova was pleased after she won and now she will face Carla Suárez Navarro<, who topped Caroline Garcia 7-6 in the third. The Spainard has lots of topspin with her heavy, one-handed backhand. However, Sharapova can hit threw her, and knock her onto the wall. Sharapova will win in two sets. American Madison Keys rose up when she had to, and she jumped over Aleksandra Krunic in three sets. Last year, she reached the final. Keys has not played extremely well this season, but now, she is forceful. She will face Domi Cibulkova, who overcame Angie Kerber. That’s a toss-up, but I think that Keys will take a breath in the third and win it. On Sunday there are two tight matches: Ash Barty versus Karolina Pliskova, and Sloane Stephens against Elise Mertens. Pliskova is totally unpredictable, but she can hit a little hard against the Aussie. However, Barty can grind her, but Pliskova will out together a number of huge first serves and win in two sets. Mertens is very steady, but Stephens rarely misses the ball, that is why she won the US Open last year. She will pound Mertens into the ground. Here are two fine contests: Kevin Anderson vs. Dominic Thiem, and John Isner versus Milos Raonic. The tall Anderson is mentally stronger now, all the time. Thiem is battling, trying and push himself forward, but I am not sure that he can return frequently. Anderson will win in four sets. Do you want a fifth setter? Well, here it is, with Raonic versus Isner. Neither of them return well, but they can serve hard and smoke their forehands. Isner will pull it off, 7-6(7) in the fifth.